This centuries old house is a living example of portuguese architecture influences and Goan heritage. Located in the scenic village of Majorda, The Godinho house stands tall, built on an elevated platform with a wide stairway leading up to the “Balcao” right at the centre of the house. With four balconies extending on either side of the entrance, the grandeur of its 18th century architecture has stood the test of time. Documents reveal that this single storied house was in existence as early as 1753, and its adjacent two-storied extension was built in 1878. As is the case with many heritage houses of the time, an ornate chapel dedicated to St. Anne is situated just beyond the front door. 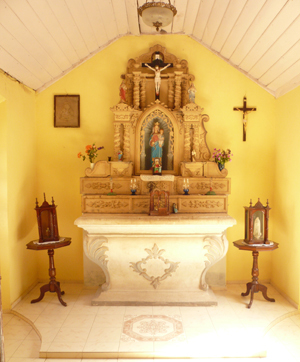 The chapel and the entrance to the house are jointly owned by the various family members who inherited the house and hence are shared by them. The Art and Learning Centre – Carpe Diem is located in the part that belongs to Daegal’s parents Luz and Lalita Godinho.